Elliott Challandes is the owner of A Healing Place Springfield providing integrative, complementary and alternative medicine. He is a Certified Practitioner by the American Organization of Body Therapies of Asia and specializes in Zen Shiatsu, which combines the benefits of acupressure and massage (see more about Shiatsu), as well as a Licensed Massage Therapist. Additionally, he is Usui Reiki and Karuna Reiki Master/Teacher and a Certified Consulting Hypnotist. Elliott provides private sessions to both men and woman, offering complementary and alternative medicine which promotes holistic health, pain relief, injury recovery, deep relaxation and the integration of mind, body and spirit. As a Zen Shiatsu Practitioner, Elliott’s treatments assist in releasing stagnation, increasing blood and fluid flow, all while allowing your body to open and expand. Shiatsu treats a variety of issues and conditions, including musculoskeletal concerns, diverse organ dysfunctions (digestion, autoimmune, sleep, energy levels, etc.) and of course, it promotes general well-being and relaxation. As a Certified Consulting Hypnotist by the National Guild of Hypnotists, Elliott has received specific training in Relaxation, Weight Loss, and Smoking Cessation, as well as earned specialized training certificates in PTSD, Regression, and Hypnosis Mastery Techniques. Elliott's approach is client-centered, putting you and your level of comfort at the forefront. You will always be aware and in control of your session. He will take the time to discuss with you what the reality of hypnosis is, how it works and what to expect. As a Reiki Master / Teacher, Elliott has been trained in both Usui Reiki and Karuna Reiki® (Registration #85477) and is an Affiliate Member of the International Center for Reiki Training. Often he will combine the warm gentle energy of Reiki with a simple meditation to achieve a deeper state of relaxation which allows your body to heal, revitalize and rejuvenate. Elliott holds a Bachelor of Arts degree from Illinois College, a Master of Arts degree from the University of Cincinnati and a Practitioner Certificate from Zen Shiatsu Chicago. He has practiced for over 20 years in the areas of guided meditation, relaxation / stress reduction, goal manifestation, personal development and complementary medicine. He often facilitates exercises, workshops and events that promote self-health and the integration of mind, body and spirit in the community. As of January 2, 2018 we are located at 838 S. 4th Street, Suite B, Springfield, IL 62703. Our suite provides a quiet and comfortable atmosphere with small reception area, private restroom, and two treatment rooms. ​Please note that the entrance to our suite is at the rear of the building. This can be accessed via the alley from Canedy Street. Off-street parking is available. Time will be given to discuss with you what your needs and goals are for the session and answer any questions that you might have. We pride ourselves in creating a safe environment where all client information and treatments are held in strict confidence. People of all backgrounds, cultures, sexual orientations and spiritual beliefs are welcome and respected at A Healing Place, Springfield. A Healing Place Springfield is located at 838 S. 4th Street, Springfield, IL 62703. It is about 4 blocks north of South Grand Avenue and one block south of Lawrence Street. The entrance in at the rear of building. 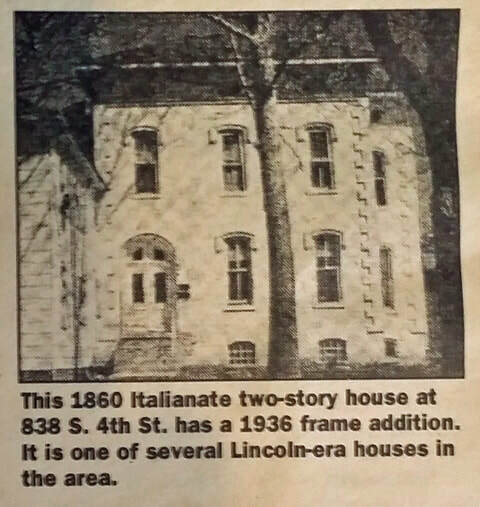 It is a 2+ story white brick Lincoln-Era building. There is new deck construction on the back at my entrance. If you are coming in from I-55 or I-72 on the 6th street exit. Come up to South Grand Avenue and turn left and cut over to 4th st. Then turn right onto 4th Street and follow the “coming up 4th Street” directions. If your are coming up 4th street, turn right onto a small cross street called Canedy, Then turn left into the alley. I'm on the left. There is off street parking at the back entrance. There is also additional parking on Canedy Street, as well as 2-hour parking in the front of the building on 4th street. If you are coming down 5th street, cross Lawrence Street and turn right onto Canedy (it's the first block south of Lawrence). Then turn right into the alley. I'm on the left. There is off street parking at the back entrance. There is also additional parking on Canedy Street, as well as 2-hour parking in the front of the building on 4th street. Please note that if you are traveling via 2nd street, you will need to cut over on Lawrence, as Canedy is closed at the 3rd street train tracks.